On the heels of "A Red Dawn?" I learned this week the Chinese state-run Xinhua News Agency announced Aug. 10 the beginning of sea trials for China's first ever aircraft carrier. A rebuild of the former Soviet Kuznetsov-class aircraft carrier Varyag. It doesn't sound too impressive. The Wall Street web site reports in its section ChinaRealTimeReport, "... do not reveal any great surprises about the carrier, based on an empty hull purchased from Ukraine in 1998." Xinhua News reports there is no need for concern as this vessel is for "research and training" which may be why there have been no planes visible on its decks. Its designation still hasn't been decided on yet. And it's not clear if this is an indication of the beginning of a Chinese naval buildup. DefenseNews.com reported on August 09, "What is certain is that it will not be the last Chinese aircraft carrier. There are indicators, though anecdotal, that China is preparing to build up to three carriers at the Jiangnan Shipyard on Changxing Island in Shanghai." And that "Observers must be careful not "to fall into the trap of using every bit of gossip from some dockside fruit seller as fact," he said. China's carrier program has become a "heavy rumor mill." With 11 aircraft carriers at its disposal, the U.S. has little to fear from China's carrier program. Even if China had several aircraft carriers, "I don't think it will reshape the strategic balance much in favor of China," said Zhuang Jianzhong, vice director of the Center for National Strategy Studies at Shanghai Jiao Tong University." Did'ja hear Burker King is finally putting that totem pole lookin' mascot of theirs to rest? Never did like that marketing scheme based on it. Something about that outfit rubbed me the wrong was. Probably that carved out frozen smile in a wooden head that portrays an artificialness to that stuck look of enjoyment. Just creepy don't'cha think?! No I don't have a clownphobia complex either! I think this get -up would'a served better handin' out cigars. Analysis of the decision comes down to not keeping pace with rival McDonalds. "...while Burger King was trying to sell consumers an edgy brand image, McDonald’s focused on something much more mundane: selling burgers, fries and coffee. The rest is marketing history." - from Forbes.com. Remember one of them first commercials they used him in? When he ran out onto a football field, made a big play? The first time I saw that I was wondering, "What in the worlllld has that got to do with what they serve?!" And the more I saw it? *Looks down* I was really wanting to see that goofy lookin' fella get that crown, all that jewelry and beard knocked off in a head-on with a DB! I ain't gonna miss him. 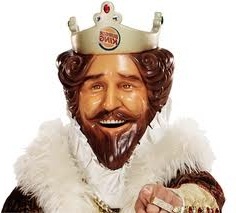 Time for the BK king to go the way of the "where's-the-beef?" lady, the Budweiser reptiles and the Taco Bell chihuahua. But ya gotta admit! The Bud reptiles were pretty cool! Are ya payin' attention to the political campaigns my fellow Americans? One recent candidate announced his bid August 13th. Three time Governor of Texas (R) Rick Perry joins the race with 16 other declared in the running for the Presidency in the Republican Party. Being what most would call very conservative politically and am probably more of a Libertarian that sees we'll never get back to that level of personal responsibility as a nation, I see the Republican Party as the best quick-fix to name but one issue... this economic mess we're in. I haven't had time to study up on the candidates yet but what I have learned is this. He's passionate! I don't know if I'd agree with his remarks saying the decision by Federal Reserve Board Chairman Dan Bernanke's decision to print more currency would be treasonous... especially when I'm not sure Bernanke even said that! All I could find is a story from CNBC.com stating the opposite. Is Perry coming swinging just for the sake of it? I don't know but I do like some of the message, considered radical by some, he's putting out. If true. 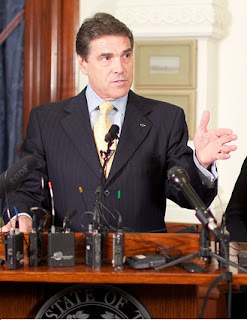 The only source for this information so far at the time of this posting is a Yahoo The Ticket news blog writer Chris Moody in his story published August 19th titled "Seven Ways Rick Perry Wants To Change The Constitution". You might be listening up for further elaboration on this if true. Take a look at Moody's story in the link below Related Links. One idea the story states you might find interesting. According to Moody Perry wants to "Scrap the federal income tax by repealing the Sixteenth Amendment." How about this picture?! This happened recently to a hapless beast in Ayrshire, Scotland. 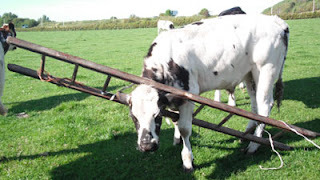 "Inspector Kirkpatrick said, "When the job came through my first thought was, this is a wind up, but I arrived at the field to find the cow looking confused but surprisingly calm despite having his head wedged tightly in between the rungs of the ladder." - from OrangeNews The cow was rescured gently from this predicament and returned to the herd but what I'd like to know is this... What is this rancher, his family or hired hand(s) doin' leavin' a ladder out around cattle?! Situations like this would be easily avoided by realizing how one's slothfulness can surely cause another (if not one's own self!) undesirable consequences. In an effort to keep my posts a bit shorter, here's my first ever hard copy published column from a few years back. I seem to be having a problem concerning my tomatoes. Well, not so much the tomatoes as much as what the family dog is doing to them. More to the point, one plant, on of the far side of the garden, on the corner. To start off with, I didn’t even want this dog. Soon after we moved to Seymour a little more than a year ago, my oldest daughter just had to have a puppy. Right about the same time our neighbors down the road had a pure bred which gave birth to a litter of mutts and were just old enough to be given away. Don’t you know, my wife and daughters just had to take a walk down the road one day when all those puppies would come bouncing up to them on the road. They came back so excited at the prospect of getting a puppy, I didn’t stand a chance. To make a much longer story short, my daughter got her puppy. Now I’ve got a dog. Kipper’s his name. His mother is full-bred pointer. I have no idea what the father was. If you’re not familiar with pointers, I’ve learned they are about the most bull headed dogs God put on this earth. So he basically fits right in with this family. After much ranting this summer I think I finally got Kipper to stay out of my garden. The plan was always to fence it in. 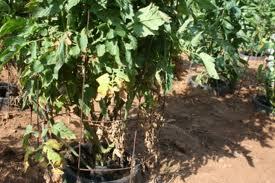 This year however there is no fence to protect that corner tomato vine from Kipper’s voluntarily “watering” it. Now that it’s about dead I caught myself fantasizing how I could teach Kipper not to “water” my plants. 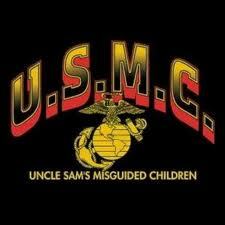 I’ve spent time in the Marine Corps so you’ll have to excuse my jar head mentality. And I’ll tell you right now my back yard neighbor has all ready warned me I won’t make it to animal heaven if I follow through with my idea of raising chickens for meat for my family. But what she can’t see can’t hurt. Can it? One thought was to run an extension cord out to the garden, replace the wooden stake that now supports a dried, crumbling vine with a ground rod, plug it in and eagerly watch from my deck for that dog to lift it’s leg. The cord wasn’t long enough. Another idea was to buy a low powered BB gun, wait for that leg to go up and pop him in the rump with a well-placed shot from the comfort of my favorite chair on the deck. I liked this idea because it would challenge my shooting skills. It’s about a 30 yard shot from an elevated position and timing would be critical. The problem is when Kip lifts his leg it’s towards the deck. One misplaced shot and I won’t have to be concerned about taking him in to get fixed. But then, is that really a problem? It’s mute point anyways as my wife won’t let me go into the Wal-Mart sporting department alone since I brought up that idea. With her help, maybe I’ve still got a chance to make it into animal heaven!